What Would Awesome YOU Do? Are You Struggling To Keep Your Blog Fresh And Active? Let Me Show You How I Keep More than Seven Blogs (You Read That Right) Updated, Relevant and Profitable! You started blogging, because every expert says blogging is the best way to establish your web presence, attract prospects, and promote your business on the Internet. But nobody ever told you blogging would be so hard. Blogging is driving you bonkers! You have to write good blog posts and publish them regularly. Once a week, at the very least. But the more, the better. What if you could learn simple ways to keep your blog fresh, attract more readers, engage with them, and gather prospects who are interested in the products or services you offer? You become a recognized expert in your field. People want to interview you on their podcasts, web TV, blogs, teleseminars and webinars. People offer you review copies of their products so you can write about them on your blog. Even if you don’t seek them out, advertisers find you and offer to pay you to place ads on your blog. You sell more and more of your products, programs and services, as well as affiliate products passively, through your blog. No doubt, your blog can help raise your status and increase your bottom line. But first you need to publish fresh, high-quality content frequently and regularly. 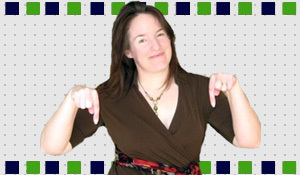 I’m Nicole Dean, and I’m the mostly sane marketer and I have more than a few blogs. And, what’s most important is, all of them make me money. I’d like to show you how you, too, can have a healthy, flourishing blog that’s full of life. And, yes, one that brings you profits. I’ve been working online from home since 2004, and in that time, I’ve learned quite a few things about the online world and blogging. … things that allow me to keep my own seven blogs alive and profitable while I work an average of 10 hours per week. I’ve been known to work 5 hours or less in an entire month. … things that enable me to guest post in 15 different blogs in as many weeks, writing daily for other people’s blogs – and still go on summer vacations and attend conferences. … things I share in my new program, Blog CPR: How to Revitalize Your Lifeless Blog with Fresh Content. As soon as you place your order, you’ll get access to all these goodies in PDF files. In the time it takes you to read one topic, you can begin improving your blog immediately. Here’s the truth: people judge your blog by the number of comments you get. This report will show you how to get more comments on your posts, and how to encourage your readers to share it around through social networks and bookmarking. Let your readers promote your posts! In this report, Susanne Myers, the creator of “Easy Link Love: A Step-by-Step Training Program for Creating Targeted Links” shows you why you need internal linking in your blog, and how to set it up right – easily. You don’t have to be an SEO expert to optimize your blog posts for the search engines. This is a report that normally sells for $15 – you get it as a bonus because I want your blog to be SAFE. PLUS… You will Get a Powerful WordPress Plugins! This plugin allows you to include an advertisement in all emails generated by WordPress to users, guest bloggers, and to your commenters. What a small investment to have a blog that will help grow your email list and ultimately bring you more affiliate income, customers and clients. What’s it worth to you to have more prospects, and make more sales of your own products as well as those you’re affiliated with? I’m practically giving this product away, because I want to earn your trust. That way, next time I create another product, you’ll know I deliver the real thing. Besides, I’m tired of seeing other people struggle with their blogs… when the solutions are so simple, doable and affordable. So I decided on this small, small price, because I don’t want money to get in the way of your blogging success. What’s more, I’m making sure this investment is risk-free for you. I’m happy when you’re happy. If you’re not happy, I’m not happy, and I will do something about it. If for any reason you’re not completely satisfied with Blog CPR, all you have to do is let me know within 30 days, and you’ll receive a prompt refund. No questions, no hassles – easy-peasy! So you’ve got nothing to lose. However, the longer you wait, the more time you lose to bring your blog to the next level. The longer you wait, the more traffic, the more subscribers, and the more sales you’re going to leave on the table. It’s time to turn your blog into a lean, mean customer getting machine. YES, Nicole, I want to learn how to blog without going bonkers! I want to grab this course (and the awesome bonuses) for the Low Price of Only $27 Today. This is a digital download (You’ll receive several .pdf Lessons). as soon as we process your order. You’ve already invested the time, money and energy to start a blog. Why let all that go to waste, just because you can’t keep it updated? Give your blog new life with Blog CPR. PS: Stop struggling with your blog and instead, turn it into a tool to help you become a star player in your niche, build a huge list of warm prospects, and attract paying customers for your business. PPS: The longer you wait, the more you miss out on the benefits of successful blogging. Start today! PPPS: Remember, your investment in Blog CPR is absolutely guaranteed for 30 days. Try it today at no risk. And, More Top Marketers are Talking about Nicole on Twitter!